For theatregoers, cast albums essentially serve two separate purposes. For those who haven’t seen a show before they provide a taste of the show and may influence a decision about whether to visit; for those who have seen the show, a cast album provides the chance to relive the show and to enjoy the memories. So when listening to The Clockmaker’s Daughter I have explored it from both perspectives. Let us first think about the latter perspective – how does this cast recording work for people who have seen the show? I first reviewed The Clockmaker’s Daughter at the Landor Theatre back in 2015. It tells the story of Constance, the clockmaker’s clockwork daughter and is, at its core, a modern-day fairytale about love and acceptance. I very much enjoyed it and I had high hopes that this show would go on to greater success. However, having not seen nor heard about it for some time, I had all but forgotten the music and story. However, having spent many bus journeys in the past week listening to the show’s music, the cast album has reminded me as to why I enjoyed it so much in the first place. With a mixture of upbeat and more melancholy lyrics, music that is beautifully written and songs which stir the emotions, it provides a great listening experience and therefore would certainly be of interest to people who have seen the show previously. Now to ask myself the more difficult question, how does this cast recording fair for those who haven’t see the show? Listening to the recording, I think it does well. It provides a good overview of the show with a range of songs and styles, and it’s possible to get a decent grasp of the story by following the lyrics carefully (although it took me a few goes to fully remember the nuances of the story) so I do believe the recording would be just as enjoyable for people who have never heard of the show. My only slight criticism is that sometimes there are runs of songs which sound a little similar and blend into one another as they are not broken up with dialogue as they would be in a show. The album itself is brilliantly sung by some of the West End’s finest voices. Christine Allado sings beautifully as Constance and her duets with Fra Fee, in particular, “Where You’ll Be,’ are simply sublime, the two voices blending perfectly. Hannah Waddingham’s ‘A Modest Modiste’ captures the hilarious yet slightly sinister nature of Ma Riley and Ramin Karimloo’s ‘You’re Still Here’ is filled with the bitter emotion of The Clockmaker. Ultimately, The Clockmaker’s Daughter is a brilliant piece of work and this cast album shows it off perfectly. I would encourage everyone to have a listen, whether you know the show or not. I sincerely hope that this is a sign of things to come for The Clockmaker’s Daughter and that we may see it back on the stage again before too long. 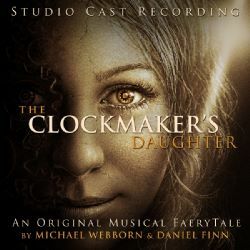 Auburn Jam Records and David Ball Productions are delighted to release the concept album of Webborn & Finn’s original musical faerytale The Clockmaker’s Daughter. The acclaimed new British musical premiered in London in 2015 and has, to date, been nominated for 11 awards. The album cast is led by Christine Allado (Hamilton, In The Heights), Fra Fee (The Ferryman West End & Broadway, Les Misérables West End & film), Ramin Karimloo (Anastasia, Phantom of the Opera), Hannah Waddingham (Kiss Me Kate and HBO’s Game of Thrones), Matthew Croke (Aladdin,Funny Girl), Lauren James Ray (Wicked, Putting It Together Hope Mill Theatre) and Graham Hoadly (Fame National Tour, Guys & Dolls Kilworth House). The cast is completed by ensemble performances from Seán Carey, Rebecca Gilliland, Caroline Kay, Barry Keenan, Matthew McCabe, Alan McHale, Leah Pinney, Emma Warren, and Suzi Zuzu Knudsen. The Clockmaker’s Daughter, an original story with original music, is set in the fictional Irish town of Spindlewood. Like most towns of age, Spindlewood has its traditions. But no practice, custom or old wives’ warning is so firmly adhered to as ‘The Turning of the Key’. Every year, on the last night of winter, as the first day of spring unfolds, the townsfolk gather to take part in a strange ritual… The Clockmaker’s Daughter is a beautiful story built around themes of prejudice, discrimination, animosity and a fear of the unknown – a folk musical with a specific, yet timeless, feel.